We meet Presley and Aaron as secondary characters in When Snow Falls. Presley comes back to Whiskey Creek almost 2 years later with a cute little boy in tow. Only one other person besides Presley knows that Aaron is Wyatt's dad...Her sister Cheyenne. Presley only comes back to town to be closer to her family because she knows that Aaron is moving to another town to open a franchise of Amos' brothers body shop. She works hard to open a yoga and massage business and ignore Aaron but he doesn't make it easy. 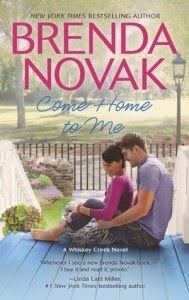 I love Brenda Novak's work in this series. I was not that much of a fan of these two characters in When Snow Falls but they seem to have grown up some in the last two years.